For information concerning the Institute for Transitional Democracy and International Security (ITDIS), please contact Dr. Sebastian Gorka at seb.gorka@gmail.com. This website is an information resourse only and does not represent the organisation or any of its members. The purpose of this wesbite is soley to provide access to information published by the Institute for Transitional Democracy and International Security. IDIS hosted a NATO Advanced Research Workshop in Budapest, March 7-9th on the radicalization of indigenous populations and how to prevent terrorist recruitment. A selection of the presentations and papers, including Peter Probst's analysis of the threat posed by the Muslim Brotherhood within the US, are availble on the NATO website. As part of ITDIS' ongoing project on transitional democracy and the role of external actors, Katharine C. Gorka's latest work: 'Homo Democraticus: or why Democracy should not be the object of US Foreign Policy' was recently published in Economic Affairs, the journal of the UK Institute of Economic Affairs. The Royal Elcano Institute of Madrid has just published Sebestyen Gorka's study on whether or not the new US Counterinsurgency doctrine that debuted last year is the best tool to fight al Qaeda. View his previous paper 'Al Qaeda and von Clausewitz: Rediscovering the Art of War', which was presented to the US Joint Special Operations University. A brief BBC-PRI interview was conducted with Sebestyen on Iraq and General Petraeus' Congressional testimony. ITDIS Founding Director Sebestyen Gorka recently spoke to the Hudson Institute's New York Briefing Council. You can order a transcript of the talk entitled "Terrorism: The View from in Europe," from the Hudson Institute. In November Sebestyen Gorka also spoke at the Beacon Hill Institute in Boston on the Legacy of President Ronald Reagan in Central Europe, and how the values the "Gipper" fought for have been forgotten in recent years. His PowerPoint presentation can be accessed here. After an initial invitation and several months of negotiations, the INSTITUTE FOR TRANSITIONAL DEMOCRACY AND INTERNATIONAL SECURITY has agreed to join the Educational Initiative for Central and Eastern Europe (EICEE). EICEE is a Washington-based international not-for-profit organization that has a presence in Vienna - The Neuwaldegg Institute, and in Prague - the Civic Institute (CI). 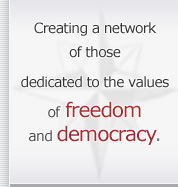 Its mission is to help promote and strengthen free, just and democratic societies in the region. It does this through training, publications and policy input on issues of great relevance to how nations recover from decades of Communist oppression; for details visit www.eicee.org for Neuwaldegg and www.obcinst.cz/en/ for CI. The founders of ITDIS believe that being part of an international network will help the institute further both its goals within Hungary and in the broader region and are very enthusiastic about being part of what will become a unique structure in the CEE region. According to one of the foremost providers of corporate and political intelligence in the UK, recent decisions by the Hungarian government may endanger not only the national security of the Central European state, but also of the NATO alliance. According to the Strategic Intelligence Review : "The Hungarian government is making a concerted effort to play down concern over the controversial background of the nomination of a Soviet-era KGB trained intelligence officer as director-general of Hungary's National Security Office (NBH). However, we believe that the case raises serious questions about the wisdom of the appointment to sensitive security posts of individuals whose past links with Moscow may leave them open to blackmail or other forms of covert pressure, particularly at a time when Russia is pursuing an increasingly aggressive policy of espionage activity aimed at NATO member states. The nomination of Col. Sandor Laborc to Hungary's key intelligence post has already attracted criticism from opposition parliamentarians belonging to Fidesz - Hungarian Civic Union (the governing party from 1998 until 2002) - who have expressed concern over the risk they claim is inherent in appointing a man who spent over six years training as an intelligence officer at the Soviet KGB's Dzerzhinsky Academy in Moscow. Centre-right politicians have condemned the decision by Prime Minister Ferenc Gyurcsany - a professed admirer of Vladimir Putin's "Russian model of democracy" - to push ahead with Laborc's nomination, and one member of the European Parliament told SIR this week that "the appointment of a man trained by the Soviet KGB to this post is utterly inappropriate..."
In a report by several domestic Hungarian dailies as well as the weekly English-language Budapest Business Journal (BBJ), shocking figures were released on the proliferation of fraud and corruption in what was formerly the economic tiger of Central Europe: "As much as 62% of national companies were subject to felony or other financial crime in the past two years, according to an international survey conducted by PricewaterhouseCoopers (PwC)." As a result, according to the BBJ "s morning news, Hungary A.M., the number of afflicted companies rose drastically within the last measured period (two and half fold), making Hungary rank above the CEE and global averages (50% and 42%, respectively). This is the fourth time PwC published its bi-annual report entitled "Global Financial Crime". TERRORIST VIOLENCE: IS RELIGION THE ISSUE? On October 30th Radio Free Europe - Radio Liberty and the Prague Civic Institute hosted the one-day conference "Islam and the West: What Unites and What Divides Us?" at its headquarters in Prague. In an usually candid event senior diplomats and experts on Islam and political violence from the United States, Iraq, Turkey, Germany, Hungary and the Czech Republic met to discuss whether there are common values amongst our two cultures which can be leveraged to combat those who would kill civilians in the name of God or politics. Please visit Radio Free Europe - Radio Liberty for more information. ITDIS Founder Sebestyen Gorka addressed the gathering in panel one: "The View from the West: are Muslim Values Compatible with those Of the West?" For those interested in Iraq, we highly recommend they visit RFE and download the report discussed in Prague compiled by Daniel Kimmage and Kathleen Ridolfo entitled: "Iraqi Insurgent Media: The War Of Images And Ideas". On October 10-11th ITDIS co-sponsored the 2nd International Counter-Terrorism Working Group hosted in Orlando by the University of Central Florida's (UCF). In collaboration with the Swedish Defence College and under the stewardship of the world's foremost authority, Brian Jenkins of the RAND Corporation, the event challenged 40 interdisciplinary experts and officials to answer 20 seminal questions on how we are doing since September the 11th 2001, how the threat has evolved and what can be done better. UCF will publish the answers to these questions by in December in the form of a White Paper. Following the great tradition of the Heritage Foundation's annual Resource Bank, between September 13th and 16th Bucharest hosted the Fourth European Resource Bank for free market think-tanks and pro-democracy organisations. The title of this year's conference was "Europe: Institutions for Liberty in the Global Context". All the institutions of the EICEE network were present with papers delivered by Father Marcel Guarnizo (EICEE Washington) on "First Principles", Chris Briggs (EICEE DC) on "Democracy and the Ethics of Freedom" and Roman Joch (Civic Institute Prague) on "Family and Education - The Basic Unit of Democracy". ITDIS's own Katharine Gorka spoke on her experiences establishing and running one of the only independent policy think-tanks in Hungary, whilst Sebestyen Gorka gave a presentation on the legacy of Communism in the region. For all the information on the various panels as well as audio files of the presentations please visit the Centre for Institutional Analysis and Development (CADI) website.